GNU/Linux distributions are well known for their ability to customize the way they work to a large degree. The purpose of this page is to give the reader some ideas on what can be customized and how. 1 What does /g/ use? Let's be honest: this is why you're really here. A common ricing configuration which can be seen among /g/ users in desktop threads usually features some of the software below. All of these can be installed from a repository via your package manager, be it your distro's main one or a user one (the AUR in Arch), or built from source. Do a little searching to find out. Text editor: Vim (or Neovim), Emacs, Nano, or Sublime Text. A desktop environment is a complete suite of software designed to maintain a certain experience in a Linux environment. It will contain a display manager, window manager, session manager, file manager, and various other default applications that a user may find useful (web browser, audio player, etc). A desktop environment is not a required part of a Linux experience, although most Linux distributions will include one by default. It is entirely possible to have a working graphical environment without installing a desktop environment, instead opting to only use a window manager and utilities that you require, and many users choose to do this. Plasma is more resource intensive, but if you want something with a bit more features, eyecandy, and stabilizability, this may be for you. Can also be made lighter and quite fast by disabling Nepomuk desktop search and/or compositing effects. GNOME is extremely polarizing. If you like the Windows 8 Start Screen and similar touch interfaces, try it out. Else, stay clear. Nearly as lightweight as Xfce, GNOME fork with a traditional desktop. Very customiseable and featureful. XFCE is a less resource-intensive DE. If you want something that runs fast and allows for lots of customization without giving up too many features, this DE is for you. LXDE is the most minimal DE around. If you are running on a toaster supercluster or just need the most battery life out of your freedom device, and are too lazy/dumb to setup a WM, LXDE is the only correct choice. A fork of LXDE that uses the QT framework, however more heavy on system resources than LXDE and XFCE. Crazy eye candy. Light on system resources. Fork and continuation of GNOME 2 for those who prefer it. A display manager is what might typically be thought of as a "login screen". It will prompt you to choose a user to log in as, as well as specify a session to be used, which allows you to switch between desktop environments easily. SLiM - The SliM project has been abandoned, and is not fully compatible with systemd, including logind sessions. Consider using a different Display manager. KDM - Display manager used in KDE. GDM - Display manager used in GNOME. LXDM - Works with almost all window managers. Currently most GNU/Linux distributions use the X Window System for drawing the desktop (with Wayland being planned to replace it later). The X.org Server is the most common implementation of the X Window System. It is designed to be modular and highly customizable. One of the results of this design is that X.org doesn't manage windows. Instead it depends on a special client application called a window manager. The window manager (WM in short) moves and resizes windows, among other things, often in response to user input. Window managers also do much more, like automatic window layout, compositing, drawing decorations, drawing panels, providing multiple workspaces, and so on. Stacking - They allow windows to draw their contents one on top of another on the desktop, starting with the one on the bottom and going up in the "Z order". Compositing - Provide a buffer for each window to draw on and then compose those buffers together creating the desktop image. 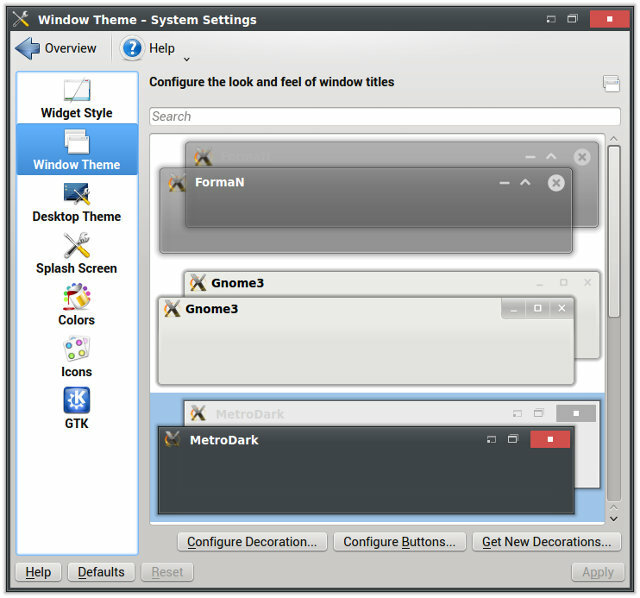 This type of window manager allows use of semitransparent windows. Tiling - The windows do not overlap. Compiz's expo plugin. As most window managers, it allows for multiple workspaces, as seen here. Dynamic tiling WMs such as awesome allow you to change the layout of the tiles, the number of tiles onscreen, and other things. it should be noted that awesome also has a stacking mode in addition to many tiling configurations. Many WMs contain both stacking and tiling modes, and the behavior can be switched by the user. It's also possible for WMs that don't tile windows to use a separate application that works together with the main window manager to automatically tiles windows (for example: pytyle). Finally, there are also composite managers such as xcompmgr that work together with a non-compositing WM making it compose windows, allowing for effects such as transparency and drop shadows. Awesome - Despite looking pretty bad of the box, it's a very popular tiling window manager. It is completely scriptable in Lua, which makes it one of the most powerful and customizable window managers once you get around to programming the configuration file. dwm - Doesn't come with a simple configuration file; instead, you're supposed to edit config.h and recompile dwm yourself. At least they make an effort to keep the code well-commented and under 2000 SLOC. Not for beginners as they themselves claim to want to "keep the userbase small and elitist", though you might want to give this a shot if you know C and you're willing to hack into the source code. i3 - One of the most popular window managers around, i3 is a fork of wmii that strives to fix the latter's convoluted code and documentation problems. Looks good out of the box and the configuration is simple and intuitive. It also provides a great amount of documentation on the webpage. Good for beginners and developers/hackers alike. monsterwm - Tiny but monstrous! Currently under 700 lines of code including the configuration file. ratpoison - Minimal WM without the need of a mouse. xmonad - A minimal window manager written and configured in Haskell. Compiz - A compositing WM being developed since 2006. It uses OpenGL (AIGLX). It is know for having a lot functionality and providing many interesting effects. However, it can cause problems if the graphics are faulty. KWin - A compositing WM used in KDE. It's comparable in feature set to compiz. Mutter - The default window manager for GNOME. Xfwm - The default window manager for XFCE. PyTyle used together with Compiz, tiling 5 terminal windows. Windowmaker - No-frills, very lightweight, fast. Makes your computer look like a mid-90s NeXTSTEP workstation. For some more information on this topic, see: this page. There are two main toolkits you need to concern yourself with styling: GTK and Qt. Luckily, there are themes for both that will adapt to the other. So find a theme for whichever toolkit your distro uses prominently. For KDE based distros, that's Qt. For everything else, that's GTK. There are a number of great themes. All of these are GTK3 compatible. To apply them, see GTK Theming. Numix - A very popular theme. SimpliX - Supports Xfwm, Xfce-Notify, GTK2, GTK3. ElementaryLi - Make your distro look like a Mac! Arc - Another popular theme. Set Qt themes with the qtconfig tool. GTK+ - Builtin. Adapts the to theme that GTK is using. KDE allows you to download most of the following by simply going into the relative setting, press the "get new" button, and search for the name. KFaenza - Port of the famous Faenza theme to KDE. Oxyfaenza - An elegant modification of Faenza. FaenK - Incomplete theme, needs KFaenza installed to display all the icons. kAwOken - Nice light/dark gray icon theme. QtCurve - Another KDE theme. Fusion-qt4 - Port of the qt5 default style to qt4, needs compiling to install. Oxygen-trasparent - Oxygen, but with transparency. Diamond - Transparency, almost unusable without composing turned off. Caledonia - Dark "flat" suite, include a Plasma theme, icons and custom colors. uniq - Another suite, includes a window decorator, a qtqurve theme and custom colors. Produkt - A dark, flat theme with minimal transparency and nice custom tray icons. Diamond - Match the Diamond Plasma theme. Infinality - This font patchset can give you some of the best font rendering there is (if not the best) on GNU/Linux. It comes with a gigantic set of patched fonts, many being optional. fontconfig-ultimate - fontconfig-ultimate is an aggregate of configuration files, patches, scripts and source packages, meant to add more presets to fontconfig and, in most cases, improve the existing font rendering. It is supposed to be used with freetype+infinality. This page was last edited on 1 March 2019, at 22:01.